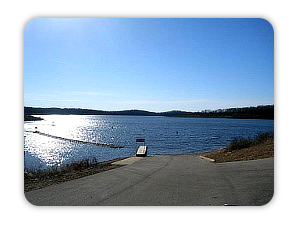 There is a full service marina and public boat ramp located less than a mile from our cabins. Please see their web page at www.pontiaccove.com for information and services. The town of Gainesville is around 10 miles away, there is a grocery store, liquor store, gas stations, restaurants and so forth located there. It is a good place to stop and load up on needed items before getting into Pontiac. Just Jackies, located near the marina, serves breakfast, pizza, sandwiches, appetizers and more. They have cold drinks including beer. As The Lake Turns Dinner and Dive is a great place to eat that is only a few minutes away. They offer appetizers, kids menu, sandwiches, pizza, and rib eyes with free delivery to our cabins or your boat. They also offer fishing guide service on Mondays - Thursdays. Their phone number is 417-679-0332. The Ranch House is located on Hwy 5 South Mo/Ar State Line and has delicious breakfasts, sandwiches, Bar B Q, hand cut steaks and a full bar. You can reach them at 417-679-0328.